We are delighted to host Noche De Tango, the spring Tango ball from City Academy on Friday, 31st May 2019. This will be a celebration of Tango in London and the wonderful student and social dancing community we have in our amazing city. We invite you to dress up, come and join us for non stop dancing till midnight only interrupted for a few minutes of performances by our amazing students' Tango company Tango Del Corazon and professional teachers. 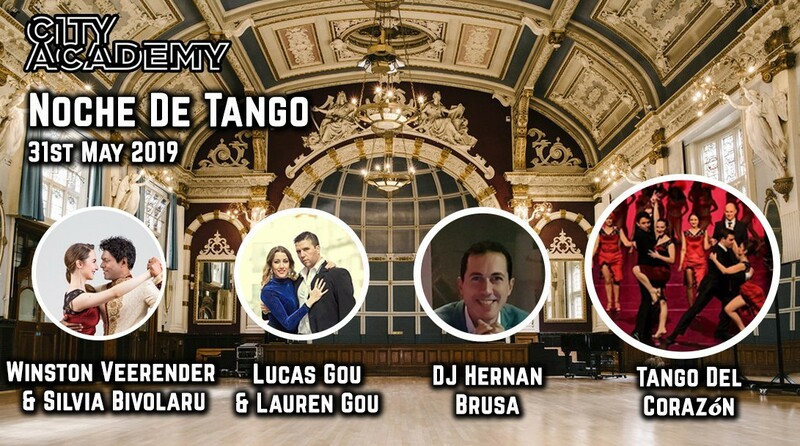 The DJ for the evening will be Hernan Brusa, well known within the London Tango community. He is specially flying in for us from Milan that day. There will also be a set of LIVE music from Balkinta tango ensemble led by clarinettist Alice Mary Williamson in collaboration with guitarist Ramiro Nocelli. They are joined by Mirek Salmon, bandoneonist of Tango Calor in Bristol. Date and time: Friday, 31st May 2019 7pm to midnight. There will be 2 separate classes for Beginners and Improvers starting at 7pm which is included in the price. The Ball starts at 8pm to the music of Hernan. The LIVE music set will be around 10.30pm.